It is important to stay protected and knowledgeable about this virus. Here in this video we will cover the 4 simple steps laid out in our campaign “Fight the Bite” as well as a demonstration on how to assemble a simple mosquito trap, that will help protect you and your family against dengue. Dengue is a virus transmitted by mosquitoes, typically through the Aedes mosquito – the ones that have black and white stripes on their legs and bodies. They typically bite during the day. If you have dengue, classic symptoms include a high fever over 38 degrees Celsius/104 degrees Fahrenheit, pain behind the eyes, rashes, muscle pain, aching joints and a severe headache. I strongly suggest that you go to the doctors and get checked. It’s a simple blood test that will tell you if you have it or not. There is no known cure for dengue and in some very serious cases, it can lead to death! In 2016 and 2017, the Rotary Club of Bali Seminyak being sponsored by Kasih Ibu Hospitals published a booklet entitled “Fight the Bite-Dengue Fever Prevention”. There were 1,000 booklets printed in English and 5,000 in the Indonesian language, Bahasa. This booklet provides simple, yet detailed information regarding protection and preventative measures that can help prevent the disease or the spread of Dengue. It also explains the different type of Dengue and symptoms of which some require direct and prompt medical attention. Within this booklet there are also photographs, graphs, and drawings explaining preventative measures regarding the breeding of mosquitos in stagnant water and its potential to promote the disease. The use of insect repellent and covered up are also emphasized and recommended. These booklets were distributed by the Rotary Club of Bali Seminyak and Kasih Ibu Hospitals throughout tourist areas of hotels and shops, but mainly focusing on the local community of Balinese including schools, clinics, community centers, and poverty stricken localities. Therefore, within the past year 6,000 booklets have been distributed throughout Bali to create more Dengue Fever Awareness. Firstly, cover up and wear long sleeves and pants during the dawn and dusk hours of the day. Use mosquito repellents on exposed skin, especially during the dangerous hours dusk and dawn. There are a variety of natural repellents also which contain either lemongrass, coconut, citronella, neem, lavender and lemon, which are all effective. You can prevent the breeding of mosquitoes by throwing away any still water which can be found in bowls, pots and ponds. Even your toilet bowl can be a potential breeding spot for mosquitoes, so keep the lid covered! Now we will show you how to make our simple, inexpensive and effective mosquito trap. Here are the items you will need: A 1.5 liter empty, plastic water bottle, paper cutter or scissors, 10 teaspoons of brown sugar, 1 cup warm water, 4 teaspoons of yeast, and a black paper to wrap around the water bottle with tape. First of all, take an empty 1.5 liter plastic water bottle and cut the bottle about one third from the top with a paper cutter or scissors. In the lower part of the open bottle, add 10 teaspoons of brown sugar. Now, add 1 cup of warm water and mix the solution. When the warm water has cooled down, add 4 teaspoons of yeast with no need to stir at this point. Now invert the bottle top and place it back into the bottle. The last step is to wrap the bottle with black paper and tape the edges closed. The trap is finished!!! For optimal results, place it in a dark corner that is dry. You will be surprised how many mosquitoes this easy trap will catch in no time at all!! We hope you will use this technique and be alert to the precautionary measures to prevent Dengue Fever and be healthy and safe in Bali. So don’t forget the 4 easy prevention steps of cover up, repel, prevent by throwing away standing water and eliminate with your mosquito trap. 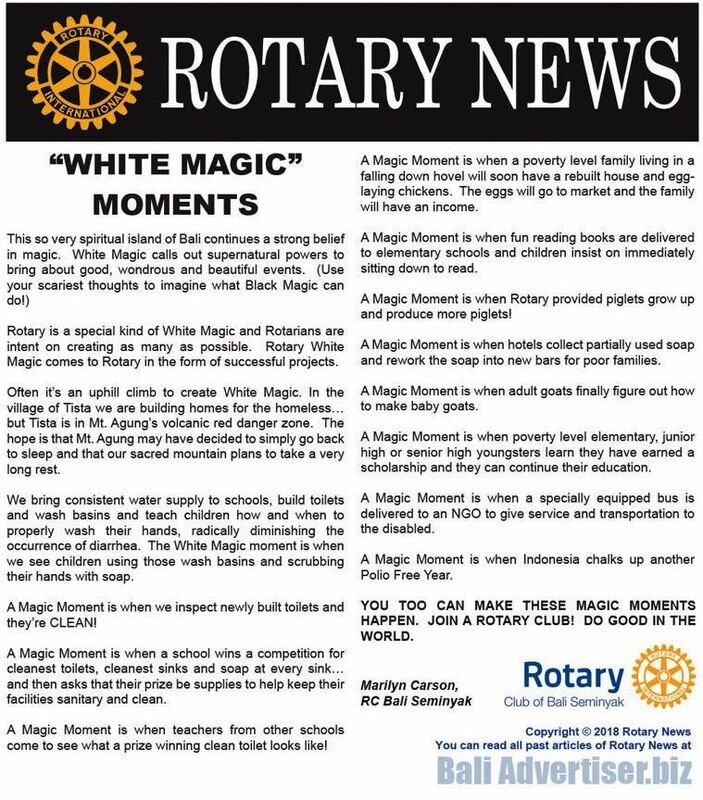 Thank you from the Rotary Club of Bali, Seminyak.